Break Away takes players from Canada and across the world onto the ice to play an exciting ice hockey-themed video slot. 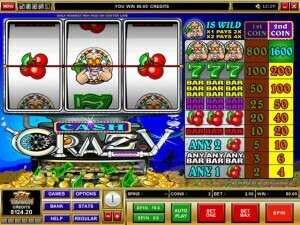 This five-reel slot features Microgaming’s popular 243 ways to win technology, and you will be smashing into the boards and slapping shots past the goalie in no time with this one. Break Away is a Microgaming slot game that you can check out at Microgaming casinos such as EuroPalace, Golden Tiger Casino, Jackpot City, and many more. You may imagine in your head a rather lazy ice hockey theme, but Break Away actually takes a few stylistic chances in regards to the lock of the game. The players on the symbols have more of a watercolored, realistic look than the kind of cartoonish art you’re used to in video slots, and the old-school thick, colored borders around the symbols make them look like 1980s hockey cards. You won’t be surprised to see closeups of hockey skates, the ice rink, players in action, a face off, zambonis, and linesmen immortalized in the game’s symbols. Animations bring a lot of excitement to the game, and if you think that an ice hockey themed slot from Microgaming wouldn’t include a typical goal celebration, with flashing light and siren, you’re definitely wrong! 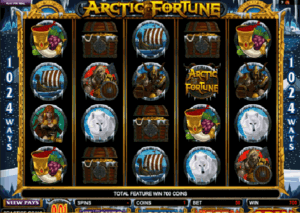 Microgaming hides a nice range of betting amounts behind a deceptively conservative coin value range that goes from just 1 cent to only 10 cents, with values such as 2 cents and 5 cents in between to choose from. 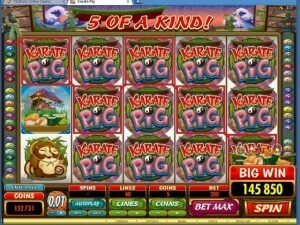 Despite the low range, with 10 coins per line and many lines to wager on, you can bet up to $50 per spin on Break Away. 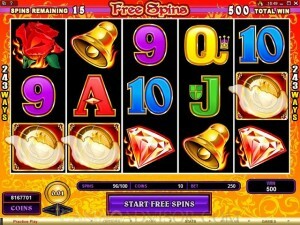 You can also play all of the lines for just 50 cents per spin. The largest prize in the game is a robust 125,000 coins. 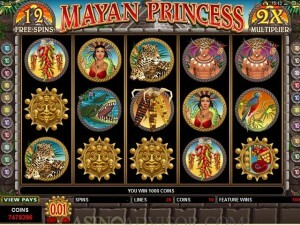 Without the help of special symbols, you can win a pretty good 5,000 coins, as well. Of course, that value goes up with more coins bet per line. 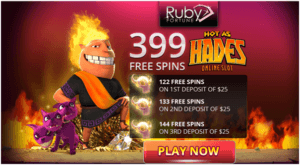 The 5,000 coin regular jackpot is earned by getting five of the skater with the red jersey on any active payline. However, if you want the 125,000 coin special jackpot, you’ll need to get five flaming pucks, which are also the scatter symbol in the game. The wild symbol in the game is easily identifiable, with a colorful and vibrantly lettered Break Away logo plastered right there for immediate identification on the symbol itself. The symbol only appears on the middle three reels, but is a stacked wild that takes over the entire reel, which is nice. There’s also a smashing wild feature that is activated when opposing team players are on the same middle reel. In that case, they smash into one another and guarantee you a prize. The scatter symbol is the flaming puck, which can be on reels 2, 3, or 5. 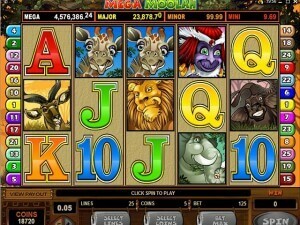 If you get five of them, you’re looking at a massive 125,000 coin jackpot. 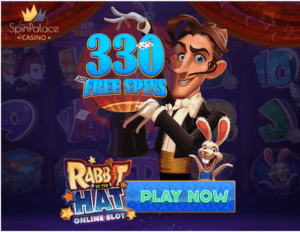 If you get at least three, you’re going to get into the free spins feature with 25 free spins to use up. Break Away does not have a special bonus game, but does have a free spins mode that activates with three or more scatters on a spin. 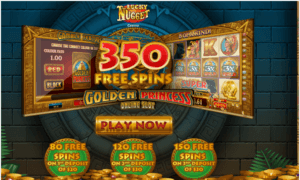 You get 25 free spins when you activate free spins mode, with bonuses available in the form of multipliers and rolling wins to increase your earnings even more. 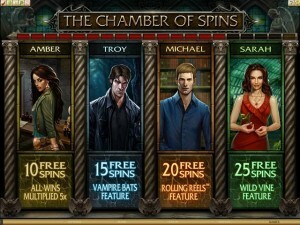 All of these bonuses can make a win of 800,000 coins possible. 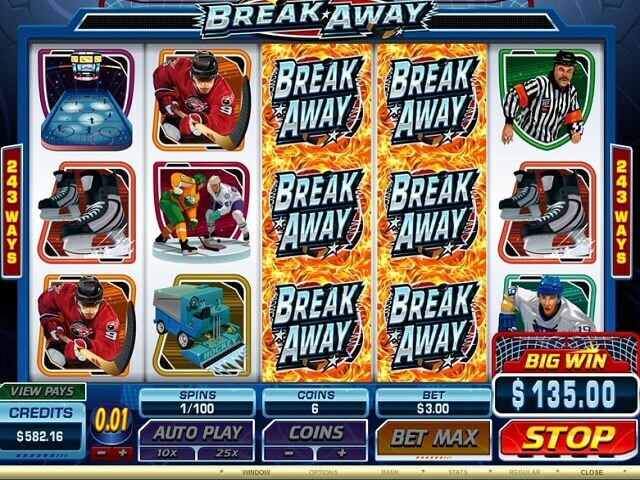 Canadian hockey fans will definitely want to “Break Away” with this fun and amusing slot game. 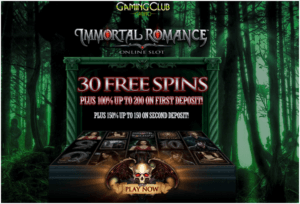 The theme is very well done, but most importantly, huge prizes are available via free spins and wild bonuses. 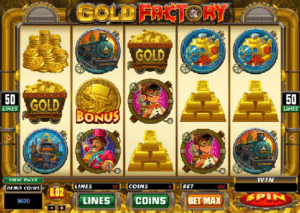 With a minimum cost of 50 cents to play all of the lines, it’s not the cheapest slot out there, but it’s easy to recommend, nonetheless.